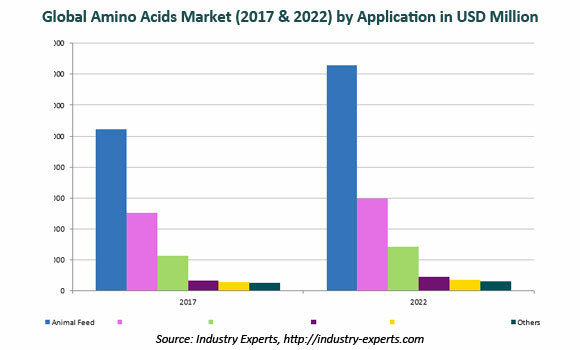 Industry Experts added the new market research report "Amino Acids - A Global Market Overview" to their Food & Beverages segment. The report reveals that the Global volume consumption of Amino Acids is estimated at 8.5 million metric tons in 2017 and is projected to reach 11 million metric tons by 2022 at a CAGR of 5.3% between the two years. Amino acids are the building blocks of proteins and play an important role as intermediates in metabolism. The 20 core amino acids that are found within proteins include essential amino acids (arginine, histidine, isoleucine, leucine, lysine, methionine, phenylalanine, threonine, tryptophan, and valine) and non-essential amino acids (alanine, asparagine, aspartic acid, cysteine, glutamic acid, glutamine, glycine, proline, serine and tyrosine). These 20 core amino acids are commercially available on the market today and are used in wide range of applications including food & beverages, animal feed, pharmaceuticals, nutraceuticals and cosmetics among others. The global report analyzes 17 amino acids comprising L-Glutamic acid/MSG, L-Lysine, Methionine, L-Threonine, L-Tryptophan, Glycine, L-Phenylalanine, L-Aspartic acid, L-Glutamine, L-Cysteine, L-Arginine, L-Alanine, L-Proline, L-Valine, L-Leucine, L-Isoleucine and L-Tyrosine. The study also analyzes the key end-use applications of amino acids including Animal Feed, Food & Beverages, Pharmaceuticals & Healthcare, Nutraceuticals, Cosmetics & Personal Care and Others. The global markets for the above-mentioned amino acid types and end-use applications are analyzed in terms of volume in metric tons and value in USD for 2012-2022 analysis period.A special focus is provided on specialty amino acids market for each region/country. The global market for amino acids is segmented into five regions namely, North America, Europe, Asia-Pacific, South America and Rest of World. The regional markets further analyzed for 18 independent countries across North America – United States, Canada and Mexico; Europe – France, Germany, Italy, Netherlands, Poland, Russia, Spain and United Kingdom; Asia-Pacific – China, India, Indonesia, Japan and South Korea; South America – Brazil and Argentina. The market is analyzed in these major regions by key countries, by amino acid types and by major end-use applications in terms of both volume and value. This 420 page global amino acids market study includes 437 charts (includes a data table and graphical representation for each chart), supported with meaningful and easy to understand graphical presentation, of market numbers. This report profiles 19 key global players and 95 major players across North America – 13; Europe – 14; Asia-Pacific – 66 and South America – 2. The research also provides the listing of the companies engaged in manufacturing and supply of amino acids. The global list of companies covers the address, contact numbers and the website addresses of 227 companies.